I really love roasted garlic. I could mash it up and eat it plain on bread. It's so sweet and creamy and delicious. I should spring for one of those counter top kind that roasts in 30 minutes, but for now, I have just found a way to do it stove top. All you do is put a whole head of garlic in a small saucepan with a lid, turn it on MED-LO and put some olive oil in there. Turn the heat down to low and just go about your business. Turn over and break up halfway through if you want. The results are as beautiful and sweet as the oven would be. Next... GUMBO! I had never had gumbo as an omni. 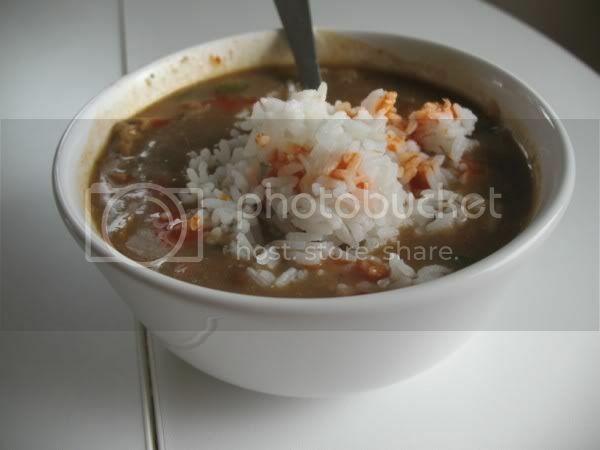 To be honest..I always have thought that Cajun/Creole food is kind of unappetizing-looking (sorry!!). To me it looks like they really did go down to the swamp, stuck a ladle in, and served it. But there are other foods that I love (Indian) that are equally not-so-beautiful. You can't always judge a food by its appearance. I was also kind of scared to make gumbo, because okra tends to have a slimy property sometimes, and also I had never made a dark roux. Well, friends..it's worth it! The flavors were deep, and the roux was fun to make. And FYI, no slime. Kittee really has a gem with this recipe. It looks sort of complicated, but just make 1/2 recipe of Julie's sausages the day before and you're fine. Use the other 2 sausages if you want to make my Lover's Pasta below. You may as well make 1/2 or all of the recipe. It's not hard to make, it just has a lot of ingredients. There's no kneading! This pasta is aptly named for a couple reasons- because both of you should eat it if you will be kissing. It’s heavy on garlic and onion, but if both eat it, you won’t notice. They say garlic boosts the libido, but who knows. This garlic cream sauce is thin. If you want a thick sauce, increase the margarine/flour or decrease the creamer/milk a little. Prepare pasta by box directions and drain. Meanwhile, add a little olive oil to a large high-sided pan on MED heat, and add onions. Cook until a little golden and tender. Add sausage slices and continue until sausages are sautéed and heated through. Season with all purpose seasoning. Remove onion/sausage from pan and add to a medium bowl. Heat a little margarine in pan. 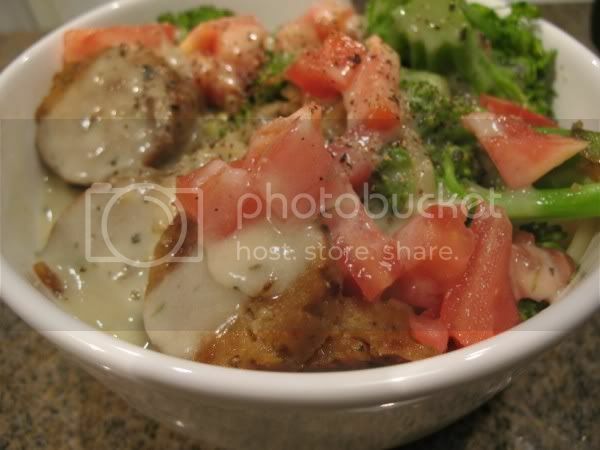 Add broccoli and a splash of water and cook until broccoli is tender-crisp. Do not over-cook. Put into bowl with sausage and onion. Meanwhile, make garlic cream sauce. Heat margarine in a small saucepan on MED until it’s melted. Sprinkle in flour/nutritional yeast and whisk constantly until flour is heated through, there are no lumps, and the mixture becomes a little puffy (few minutes). Add about 1/3 of the soy creamer/milk and whisk. It will be very thick. Add the garlic and the rest of the cream while whisking and continue to whisk. Cook until sauce is bubbling but not a rolling boil. Put pasta into each serving bowl, top with sausage/onion/broccoli mixture. Top with sauce. Garnish with fresh tomatoes if desired. Oooh, thanks for the recipe and the tip on roasting garlic on the stove. 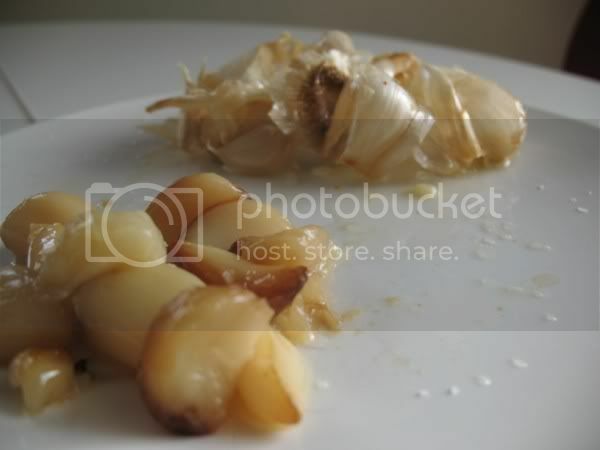 I love roasted garlic but don't always think ahead...I refuse to turn the oven on just for that! I'm definitely trying your method. glad you liked it! yay. I'm making it now. If scent is any indication, it's going to taste awesome. I've got a protip for anyone who, like me, is a total nubcakes. When the recipe states, "Carefully add the roux into the simmering broth...", it means just that. DO IT SLOWLY. It was messy. So anywho, there's my $0.02 worth. Thanks for the recipe Kittee via Pamela. yumbo!! 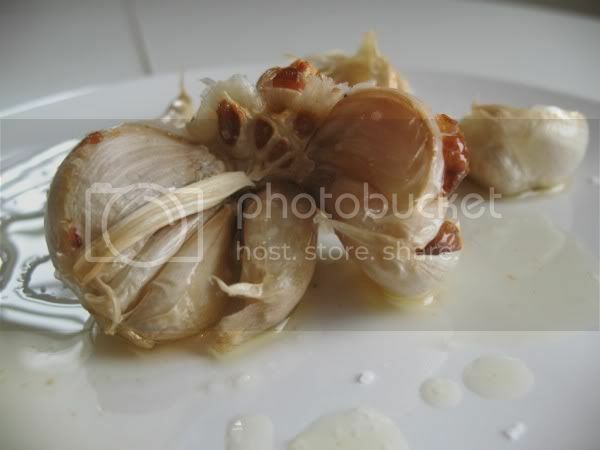 stovetop roasted garlic is a great idea!